ZOTC is the U.S. Army's training center for light infantry and special operations units since 2015. "Keeping the Art of Zombie Warfare Alive"
What would you do if you were dropped in the middle of zombie infested woods with only the clothes on your back? Your challenge is to survive more than 5 minutes. You must forage for weapons, food and water. Accomplish all of the above in under 5 minutes or you will die. In addition to the Zombies, Drone soldiers also patrol the area and will fire upon you. 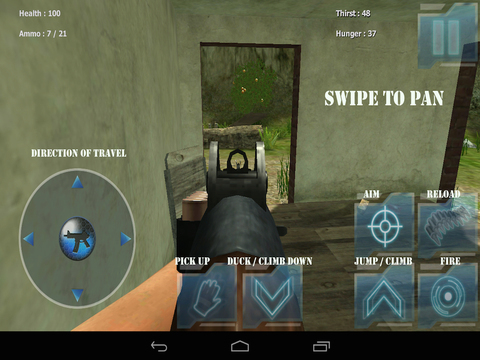 To pick up objects get your crosshairs on it and tap the hand to retrieve it. Swipe the screen to look around. The Army Zombie Operations Training Center (ZOTC) consists of 23,000 acres of single and double canopy jungle and forest. ZOTC provides the United States Army the only live fire zombie environment to train infantry units in the art of zombie warfare. Fort Apocalypse is surrounded on the North and North-West by the Sea, on the South and South-West by rivers and the East by the bay and the lake. The cross-compartmentalized terrain on the ZOTC consists of rolling hills, numerous tributaries, mangrove swamps and coastline. This training area is a unique and challenging training environment. Some pointers you may find helpful if you survive longer than 5 minutes. Ambushes are a favored tactic in the school. The dense vegetation and relatively few roads and trails make them very effective. Be alert because the enemy can come from any direction, forcing you to re-orient your ambush. Remember that the trees and foliage reduce the effective range of your weapons. Minimize movement in the ambush area, especially at night. The dense vegetation and lack of ambient light can cause you to make a lot of noise. Reconnoiter your ambush site and, if time allows, set in during daylight hours. Do not wear helmets; they degrade your hearing and reduce your peripheral vision. Travel in a series of short, deliberate movements. Your maximum cross-country speed should be 200 - 300 meters per hour. Take listening halts. Avoid trails and natural lines of drift whenever possible. If you must move on a trail, travel slowly. Carry water and more than your basic load of ammunition. Expend it liberally to break contact. Always remember that you are the "Indians," not the "cavalry." Due to the limited visibility of the jungle, the hasty attack is the most likely scenario. 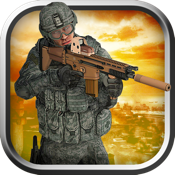 React quickly with every weapon that you can bring to bear as soon as you contact the enemy. 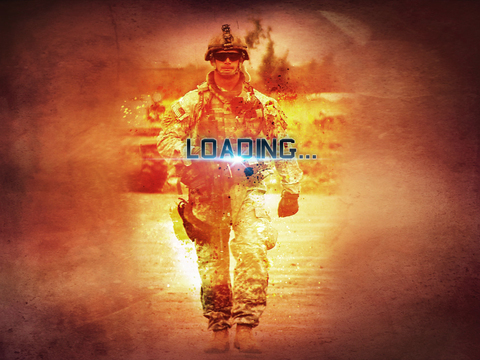 Gain immediate fire superiority and keep it. Do not wait for a clear visual target to open fire. Fire at smoke, muzzle flashes, or by sound. Otherwise, the enemy will gain fire superiority. Keep in mind that most successful counterattacks take place within 15-20 minutes of the enemy leaving the objective. Establish your limit of advance (LOA) after careful consideration of the terrain. If at all possible, establish it along a easily discernible terrain feature. Task-organize to provide 360-degree security on the objective as you sweep to the LOA. Reconnoiter the near side of the objective first. Do a far side reconnaissance of the objective after you have cleared between the LOA and the objective. This will dramatically reduce your chances of compromise. Consider using an indirect fire preparation of the objective. Be aware of stay-behind “Nasties” as you approach the objective.